The observations show that the river of plasma, travelling at nearly the speed of light, may follow the spiral structure of the black hole's magnetic field, which astronomers think is coiled like a helix. The magnetic field is believed to arise from a spinning accretion disc of material around a black hole. Although the magnetic field cannot be seen, its presence is inferred by the confinement of the jet along a narrow cone emanating from the black hole. The visible portion of the jet extends for some 5000 light-years. M87 resides at the centre of the neighbouring Virgo cluster of roughly 2000 galaxies, located 50 million light-years away. The images are part of a time-lapse movie that reveals changes in the jet from 1995 to 2007. 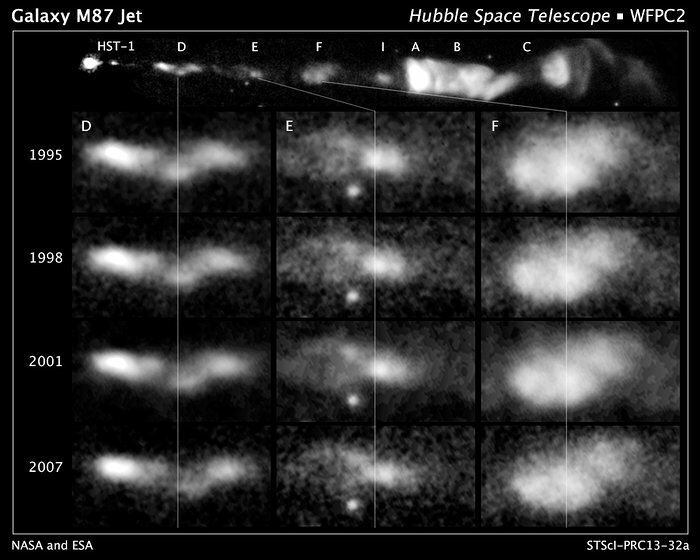 They were taken by Hubble's Advanced Camera for Surveys in 2006 and the Wide Field Planetary Camera 2 in 1995, 1998, 2001, and 2007.